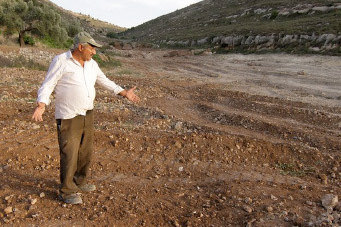 A Palestinian Christian family that preaches non-violence from a farm in the West Bank is battling to hold on to land it has owned for 98 years. Now surrounded by Israeli settlements, the family is a living example of the idea of peaceful resistance. 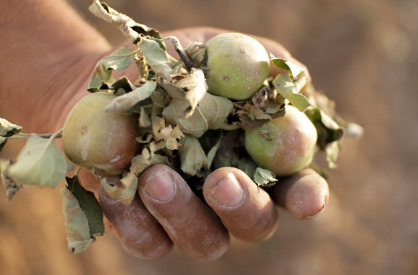 On his farm outside Bethlehem, Daher Nassar is picking apples from the ruins of the orchard he planted at least eight years ago. The fruit is scattered across ground freshly opened and imprinted with the tracks of a bulldozer. At the field’s edge, branches reach out from inside a mound of earth, the bark stripped and mangled, unripe almonds still clinging to the trees. A spokesperson for the Israeli military authorities in the West Bank said the trees were planted illegally on state land. Nassar’s sister, Amal, has a different explanation. The government, together with the Israeli settlers who live around the farm, is “trying to push us to violence or push us to leave,” she says. Amal insists that her family will not move from the land, nor will they abandon their commitment to peaceful resistance. 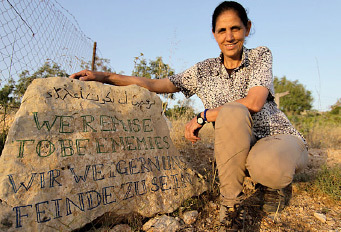 That phrase, which is painted on a stone at the entrance to the farm, was first used by her father, Bishara Nassar. 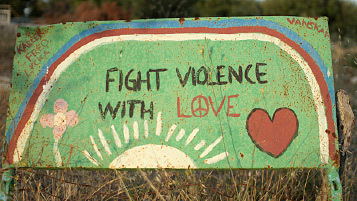 Long before the concept became widely known among Palestinians, he taught his children a theory of non-violence that was rooted in his own Christian beliefs. 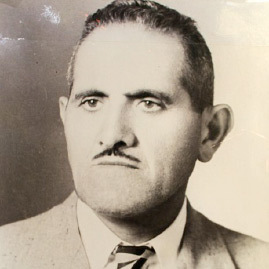 Bishara (“Gospel”) Nassar was a child when his father bought this land in 1916. Even at that time, as World War One transformed the Middle East and the Ottoman Empire limped to an end, Palestinian Christians were beginning to emigrate. After the war of 1948 the Christian exodus from the West Bank quickened, and Bishara, who was a gifted preacher and accordionist, began to travel round the nearby villages, singing songs and leading Bible study in family homes. Music and stories, he thought, might deepen the faith and lift the spirits of Bethlehem’s Christian children, encouraging them to stay. Bishara also came to believe that the Christian community had a special role to play in building a more peaceful future. Guided by that vision, she and her brothers have transformed the farm into a centre for peace-building and non-violent resistance called the Tent of Nations. For more than 20 years they have held workshops here, welcoming Israeli students, rabbis, and peace activists, as well as groups from across Europe and America. They run summer camps for local schools, teaching Palestinian children about non-violence and encouraging them to develop a love for the land by working and playing on the farm. This is especially important, says Amal Nassar, for a generation that has grown up in the refugee camps and urban sprawl behind Israel’s separation barrier. She also trains Palestinian women in non-violence, while her mother – Bishara’s widow, Milada – cooks traditional food for the day’s guests. Milada Nassar says her husband would have been proud of what his children have created. But in the years since his death in 1976, the family’s commitment to non-violence has been tested in ways he could never have imagined. At that time the West Bank had been under Israeli military rule for almost a decade, and Jewish settlers were just beginning to move into the area south of the farm. For the most part, though, the hills around Bishara’s land were still open countryside, farmed by Palestinian families or used as grazing by shepherds. In the 40 years since, Israeli settlements have been built on every one. 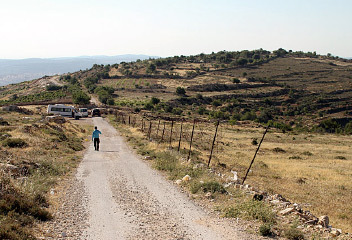 There are five settlements in total, the nearest so close that the settlers’ voices carry across the valley to the farm. The most recent, Netiv Ha’avot, is little more than a strip of houses encircled by coils of razor wire and festooned with Israeli flags. The largest, Beitar Illit, is a town of more than 40,000 people, a blaze of lights on the hillside at night. All of them are considered illegal under international law, though Israel disputes this. As they watched the settlements rise around them in the 1980s, the Nassars began to worry. 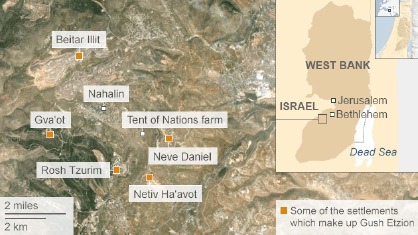 Their farm was in a prime location, close to the main north-south road through the West Bank and on high ground. In 1991 their fears were confirmed. The military authorities declared that more than 90% of the farm now belonged to the State of Israel. Gush Etzion, one of the biggest settlement blocks in the West Bank, looked set to expand on to the Nassar farm. The Nassars, though, refused to leave, or to see the land divided. And virtually alone among Palestinian farmers, they had the documents they needed to launch an appeal in the Israeli courts. In 1924, realising that the Ottoman Empire was finished and worried by rising tensions between Arabs and Jews, Bishara Nassar’s father had registered his property with Palestine’s new imperial rulers. 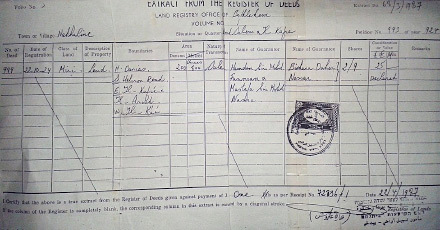 The British issued land deeds that specified the size and borders of the farm, and Bishara’s father, who was a literate man, held on to the documents. Almost 70 years later, those papers would form the basis of a legal case that has been in front of the Israeli courts for 23 years. It remains unresolved. “They know very well that the Palestinians cannot afford to defend the land,” says Amal Nassar, “so they give up hope and leave.” But the family have somehow found the money and determination to keep their appeal alive. The way Amal sees it, the Israeli military and the settlers, having failed to evict the family by legal means, are now trying to force them out. She remembers the settlers who uprooted 250 young olive trees in 2002, and who permanently closed the road to the farm with rubble. The demolition orders posted on the gate, threatening to destroy the Nassars’ home and water wells. The soldiers who, in 2009, forced her 72-year-old mother out of bed at gunpoint in the middle of the night and made her wait in the cold while they searched the farm. Palestinians have a word that captures this refusal to be provoked or demoralized: sumud. Sometimes translated as ‘steadfastness’, sumud describes the stubborn, patient determination to stay on the land and to carry on in spite of all the difficulties of living under military occupation.